Rising home prices continue to fuel fast growth in household equity. CoreLogic said on Thursday that owners of mortgaged properties in the U.S. (roughly 63 percent of all homes) gained an aggregate of $766 billion in additional equity between the second quarter of 2016 and the same quarter this year. This is an increase of 10.6 percent in nationwide equity over that period. The average increase for each homeowner was just under $13,000, but the distribution is far from even across the states. 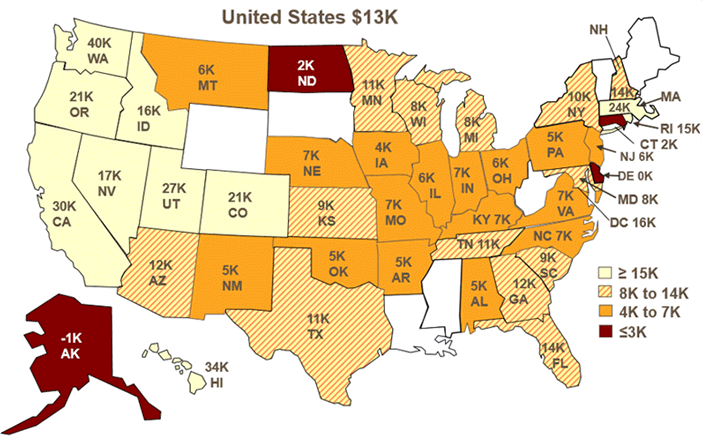 A few states in the west, notably Washington, Hawaii, and California, with equity gains of $40,000, $33,000 and $30,000 respectively, have offset much poorer performances elsewhere. Homeowners in Alaska saw their equity decline by an average of $1,200 and Delaware homeowners also posted a tiny loss. On the other side of the ledger, the number of underwater homes declined by 10 percent from the first quarter of 2017, to 2.8 million properties, or 5.4 percent of mortgaged homes. A year earlier 7.1 percent of mortgaged homes had been underwater, a total of 3.6 million properties. This is an annual decrease of 22 percent. Negative equity had peaked at 26 percent of mortgaged properties in the fourth quarter of 2009. Nevada, the state most heavily impacted by the foreclosure crisis, still has the highest negative equity share, 10.62 percent. It is followed by Florida at 10.03 percent and Illinois at 9.56 percent. "Over the last 12 months, approximately 750,000 borrowers achieved positive equity," said Dr. Frank Nothaft, chief economist for CoreLogic. "This means that mortgage risk continues to decline and, given the continued strength in home prices, CoreLogic expects home equity to rise steadily over the next year." The aggregate value of negative equity rose slightly from Q1 to Q2, from $284.2 billion to $284.4 billion, an 0.1 percent gain. However, it dropped by approximately $700 million or 0.2 percent from Q2 2016 to the same quarter this year. "Homeowner equity reached $8 trillion in the second quarter of 2017, which is more than double the level just five years ago," said Frank Martell, president and CEO of CoreLogic. "The rapid rise in homeowner equity not only reduces mortgage risk, but also supports consumer spending and economic growth." CoreLogic estimates another 5 percent increase in home values would lift another half-million homes into positive equity.